Brrr, baby, it’s cold outside. This time of the year is one of the hardest for me. The time between January 1st and the end of March just puts me in a sort of funk. As much as I love cozy food and snuggling under heavy blankets with warm dogs by my feet, this is about the time I start to crave fresh air and sunshine like crazy. I combat these winter doldrums with a few constants: warming stews and soups, lots of red wine, and copious amounts of hot drinks. Coffee being my favorite. It’s no secret that coffee is my lifeline in the mornings. Anyone who knows me well knows that I must have my coffee shortly after waking to be functional. I not only love the boost it gives me but the taste as well. I also can feel good about my daily coffee habit, given just how good it can be for you. During the week, it’s usually your standard cup of coffee with some milk and sugar, but on the weekends, I often take time to do something more indulgent and special. Because weekending is everything! 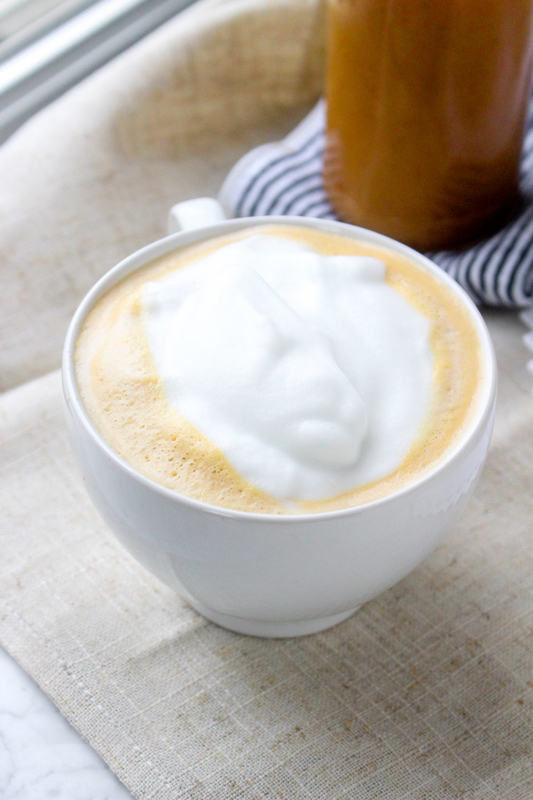 Espresso is something both my husband and I adore, and coming up with fun, at-home deluxe coffee drinks is a great excuse to experiment in the kitchen. And 9 times out of 10, it yields something extraordinarily delicious. 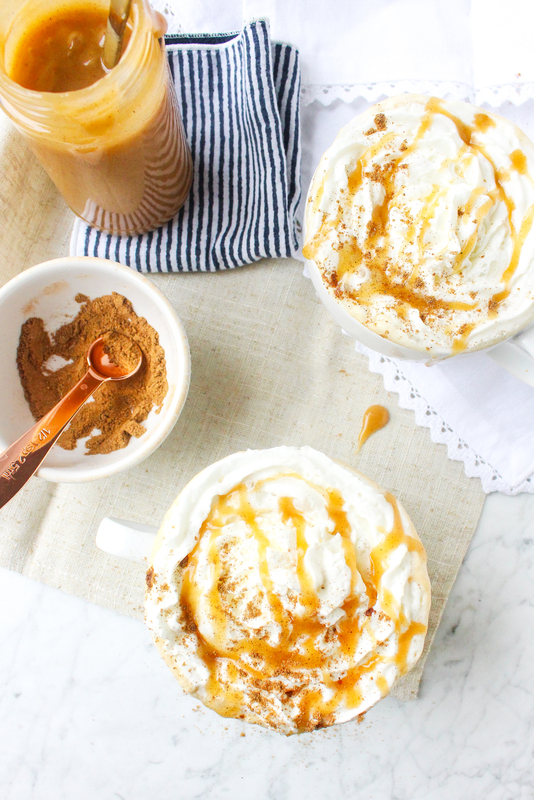 Like these chai caramel macchiatos. Woah, baby, are these scrumptious. Really, anytime someone says “caramel” I’m already sold, but in this case, the caramel really is extra special. 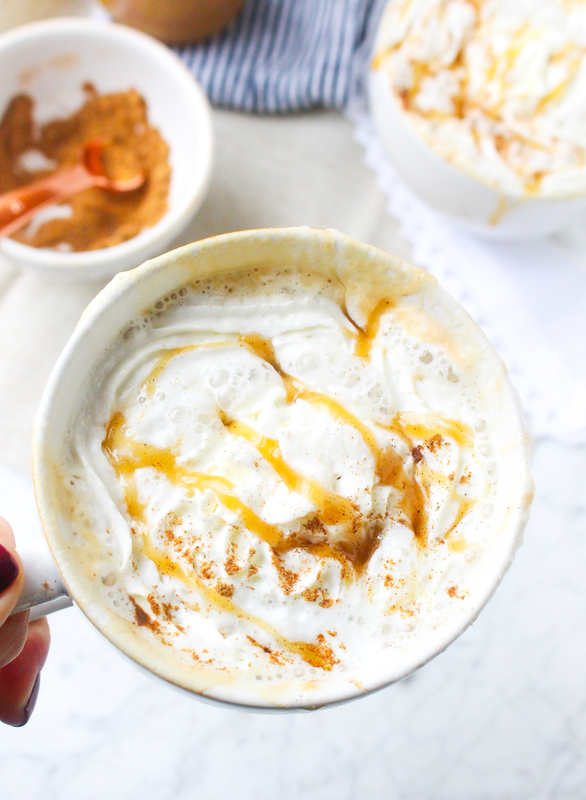 Thanks to the flavors of chai spice, the coziest of them all. 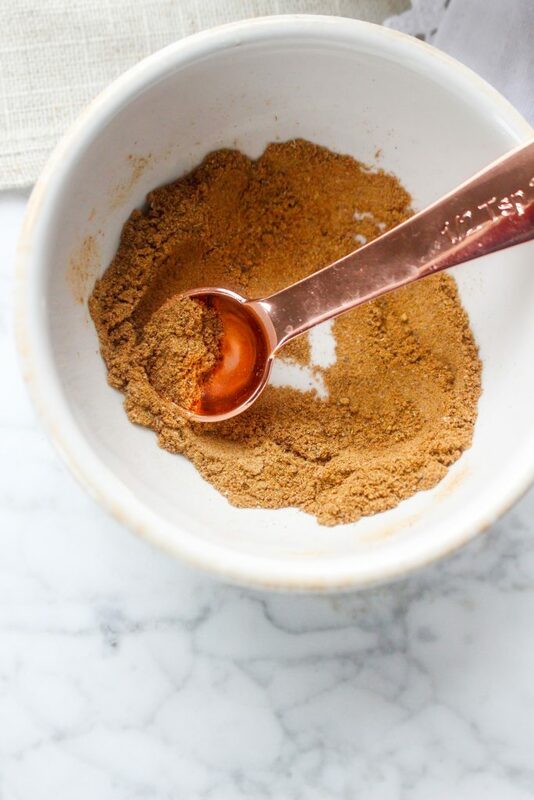 Chai spice is one of my favorite flavors and while I love sipping it in hot tea form, I REALLY love to use it in my baking. These muffins are loaded with chai spice and some of the best to come out of my oven. Come to think of it, they would go swimmingly with these macchiatos. You should probably make that happen. Stat. These macchiatos start with the caramel, which is delicious enough to eat off the spoon by itself (not that I’d know anything about that). It would be wonderful drizzled over just about anything, but it pairs especially well with the richness of Gourmesso espresso. 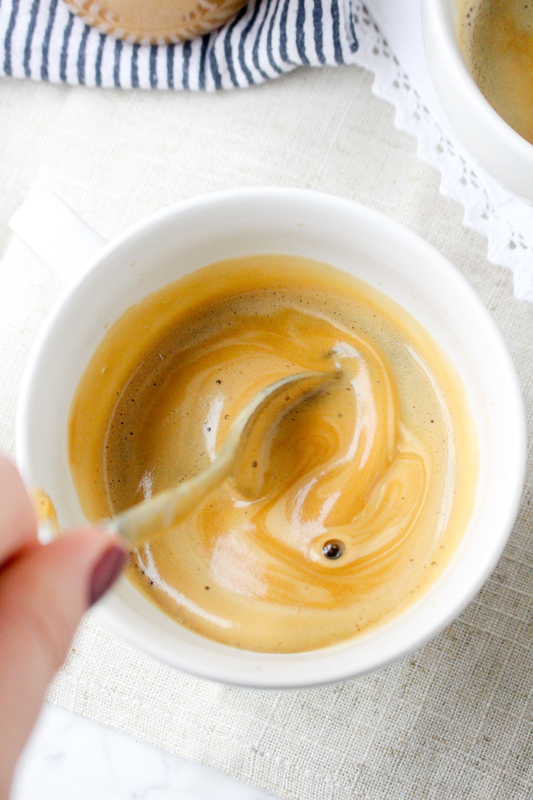 Have you tried Gourmesso coffee capsules yet? I had the opportunity to test them out and was seriously impressed. Their selection and quality of espresso/coffee capsules is fantastic. When used with my beloved Nespresso machine, a rich, robust espresso with a beautiful crema is the result of these capsules. The Lungo Italico Forte capsule is my favorite to use with these macchiatos because of the bold, slightly sweet coffee flavor it imparts. 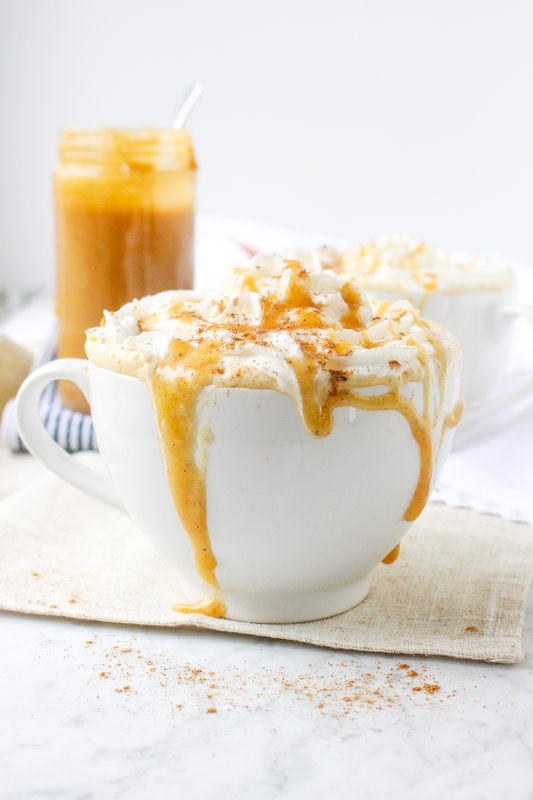 It works wonderfully with the spiced flavors of the caramel, too. 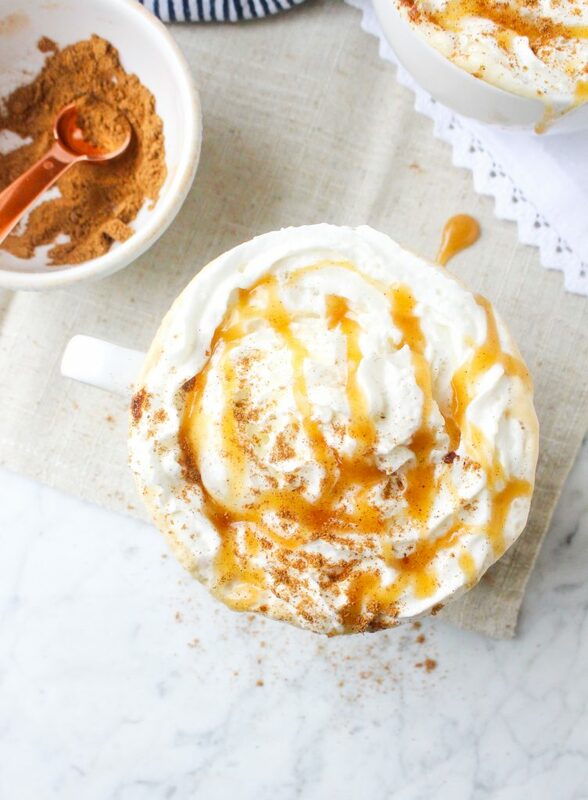 Next, frothed, hot milk is whisked into the rich espresso and caramel, and it totally rounds things out. A little dollop of whipped cream never hurt anyone, either. Just before serving, I like to sprinkle these with a little more caramel (because I’m obsessed) and some of the chai spices as well, just to emphasize what we’ve got going on here. Which is weekend morning perfection. Melt the butter in a small pot over medium heat and add the sugar. Whisk until the sugar is mostly dissolved. Slowly add in the heavy cream, spices, and sea salt and whisk constantly until the mixture comes to a gentle boil. Reduce heat to low and simmer for 2-3 minutes, whisking frequently, until the mixture thickens. 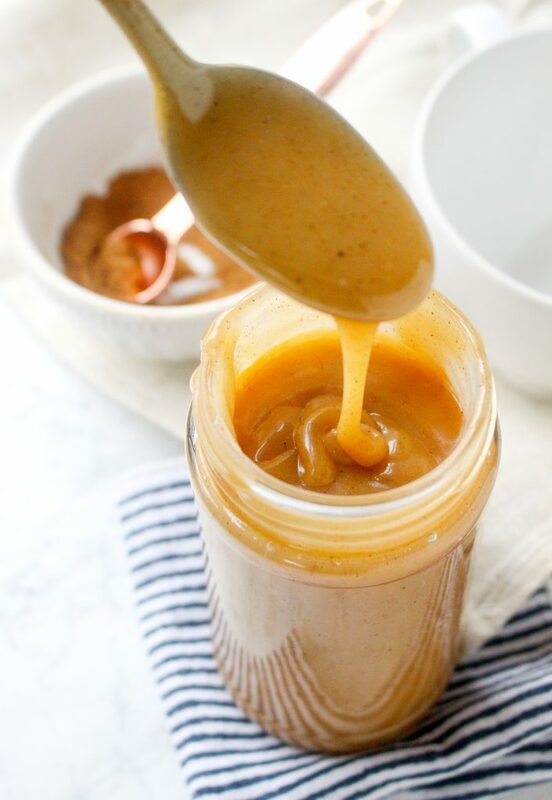 Remove the caramel from the heat and whisk in the vanilla bean paste. Use immediately or transfer to an airtight container for later use. 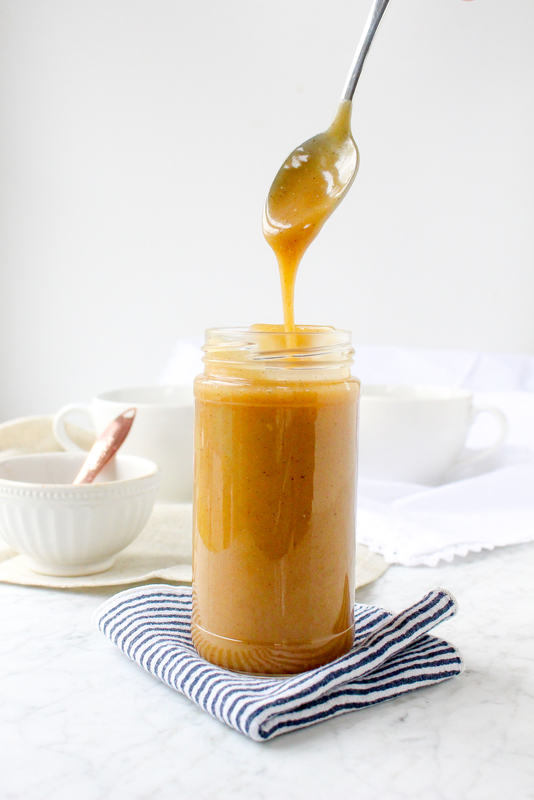 The caramel will thicken as it cools. 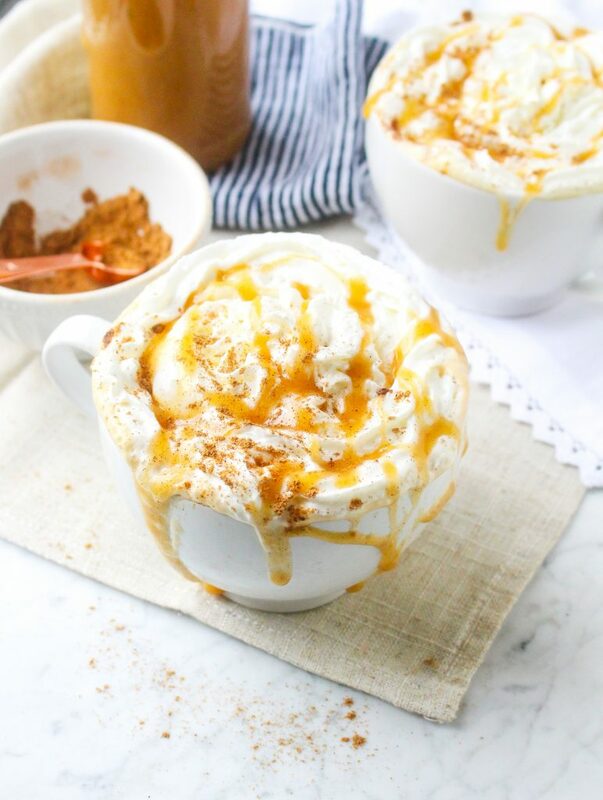 If using later, reheat the caramel in a microwave on low in 10-second increments until pourable and warm. 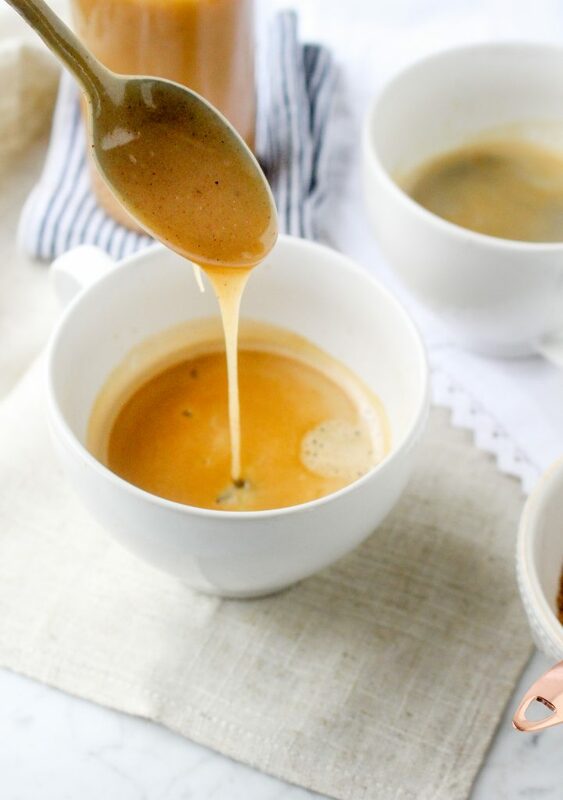 Pour the espresso into two glasses and then stir in the caramel sauce. Start with 1-2 tablespoons per glass and then add more, as needed, to meet your tastes. 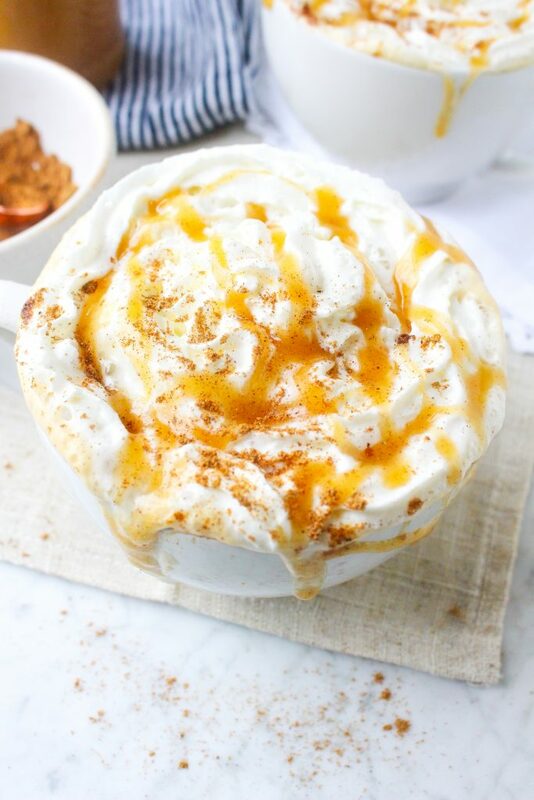 Pour the frothed milk over top and garnish each glass with a dollop of whipped cream, another drizzle of caramel, and a dusting of chai spice. Serve immediately. Now THIS is how I want to kick-start my day! Looks SO stinking delicious. Definitely gonna need to try this one soon! Thanks so much, Karly! They are definitely a morning treat.